We got the easy job, stopping in at M-A as the riders from the 2016 Tour de Menlo concluded their 35-, 45-, or 65-mile ride today. Weather conditions were near perfect, mid-70s with a slight breeze. The riders we visited with remarked that the Tour de Menlo is always a well-planned, good event. 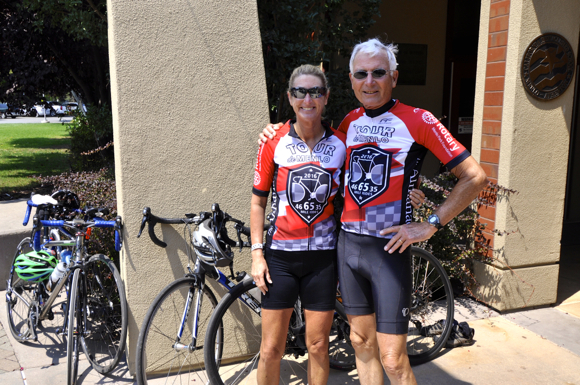 Fast Freddie Rodriguez, who had led one of the training rides, was there with his wife, Annie (photo, top). They’d done the 45-mile ride as had Menlo Park resident Jym Clendenin, whose daughter, Anne (photo, bottom), joined him for the first time. Early unofficial results show 522 cyclists took park and, with sponsors, helped raise about $40,000 that will be split evenly between the Rotary Club of Menlo Park Foundation for need-based college scholarships and the Almanac Holiday Fund, which supports 10 local nonprofit agencies.